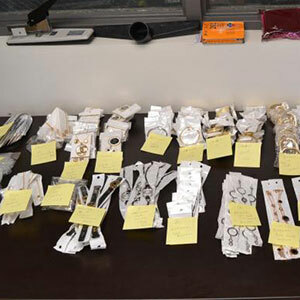 On March 6, U.S. Customs and Border Protection (CBP) officers in Philadelphia seized a package with 269 pieces of counterfeit designer brand jewelry coming in from Hong Kong. The parcel contained necklaces, bracelets, earrings, and diamond pendants purporting to be items from leading jewelry brand names like Cartier, Chanel, Bulgari, and Tous. If authentic, the jewelry items would have had a manufacturer’s suggested retail price (MSRP) of nearly $1.4 million, the CBP said in a statement. The parcel was being sent to a Philadelphia address and was listed as containing a stainless steel pendant with earrings. When CBP officers examined it, they found it contained various designer jewelry items exhibiting both substandard quality and packaging. CBP officials suspected that the items were counterfeit and sent them to their trademark experts, who worked with the trademark holders and determined the items, pictured below, were indeed fakes. This is the Philadelphia CBP’s second significant counterfeit seizure within the last two months. 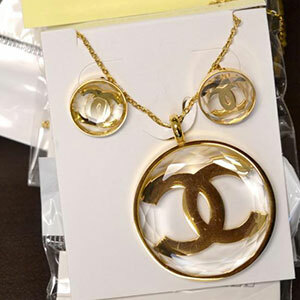 On Feb. 27, CBP officers seized 54 counterfeit designer brand watches, also sent from Hong Kong. That parcel contained phony timepieces purporting to be from such brand names as Armani, Cartier, Hublot, Olivia Burton, Omega, Pandora, Rado, Rolex, Swarovski, and Tous. If authentic, those watches would have had an MSRP of $233,209. On a typical day in 2017, CBP officers seized $3.3 million worth of products for intellectual property rights violations.